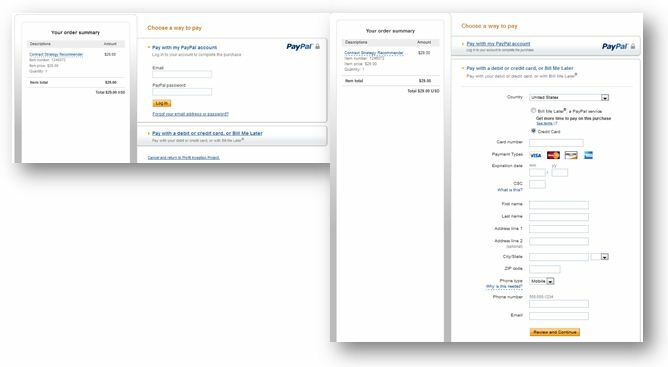 You have the option to manage your purchase either by using your PayPal account, or directly your Credit Card. Both ways are equally secure as these are being managed by PayPal, which is the fastest and safest way to send money, make an online payment, receive money or set up a merchant account. Customer clicks on “Add to Cart” Button and then Customer is taken to a shopping cart (see below an example), where you can see what you are purchasing, how much it costs, and enter your discount code (if applicable). If there is just one single product which customer wishes to purchase, there is a possibility to click on the ”Buy Now” button which will lead the Customer directly to the checkout page (see below an example). Customers are then taken to a page where they fill in their billing information. The Customer has the option of checking out either with PayPal or with your Debit or Credit Card. After purchase is complete, literally 10 seconds later, an email is seen in Customer’s inbox, with a link to download the eBook and/or any other purchased electronic product. And itʼs as easy as that! Get it NOW for Best Price! Supplier Relationship Management (Database) – Be part of it, enlist your company!